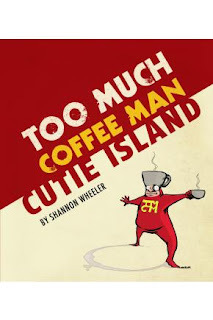 The Fellowship was fortunate enough to obtain a copy of TOO MUCH COFFEE MAN: CUTIE ISLAND from BOOM! Studios. Shannon Wheeler writes and draws. This stuff is funny. It’s definitely a very dark humor, and it’s not always rip-roaring, laughing-out-loud funny, but it’s funny. And it often has some level of emotion wrapped up in it, which gives it an almost philosophical flavor. (Not sure if you can tell yet, but it’s really pretty hard to describe.) Those emotions are often dark, but the humor helps the reader relate (if they don’t already). But please don’t take my difficulty in describing it as criticism; I actually find it refreshing. I like the sense of originality, and the simplicity of the presentation (Wheeler draws it himself, with no color, much like a newspaper comic strip) adds a great deal to that sense. And like I said, it’s funny. TOO MUCH COFFEE MAN: CUTIE ISLAND is available now at your FLCS or by order from boom-studios.com.